Lol XD Shadow pulls out a straightjacket, and everything is good again...... for now. And Angel, he gets a bit of wine to cheer him up. Angel comes back down and drinks his wine in his chair sighs heavily and is just "Wow....Well...That much betta..."
Luna walks back in behind Shadow, and then Angel looks ready to fly back up onto the ceiling.And Shadows like, chill my dude, she's not under influence anymore. Angel sighs in relief and just reasponds like "Oh good. Now I can finally relax..."
Shadow grins and Luna looks uncomfortable when shadow says, Enjoy this time now Angel, cause February 19th isn't far from now. 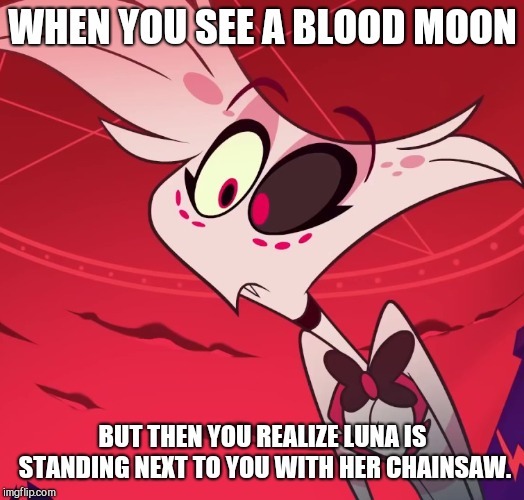 WHEN YOU SEE A BLOOD MOON; BUT THEN YOU REALIZE LUNA IS STANDING NEXT TO YOU WITH HER CHAINSAW.